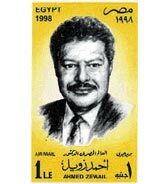 I've recently got Ahmad Zewail's biography (the Egyptian Nobel laureate for Chemistry '99). It's nice and has some interesting pictures. Most interestingly, in the last 2 chapters he talks about his vision for enhancing the state of research in Egypt/Arab World and then US. The TP idea is cool. It aims to create a place where academia & industry can meet and do experiments & research related to the industry. I couldn't find any more info about the details - but it definitely sounds interesting. 6- ... there's one more. I can't remember. "I have had first-hand experience with UST and other projects in Egypt and have seen how bureaucracy and the 'power of the chair,' or more accurately the power of position, can impede real progress." "Although clear orders regarding UST have been issued, the slow implementation of the plan is enough to subdue the enthusiasm of any serious person with obligations and exacting demands on his time." "Ironically, some of the very rich were less willing to make significant contributions until they had weighed their personal benefits." "The public sector was pushing me to begin a national donation campaign believing that every Egyptian should participate in this national cause. But of course, I could not do so without a new law that guarantees that UST will be able to function freely." RECENTLY I've heard that he gave up on Egypt government and went to Qatar to create his university. It seems that they have started building the university and that it's on its way. Also heard that he asked for "10 year grace period" after which results can be expected. So, the question for you readers - Do you know anything about his project in Qatar? it sounds interesting. I looked on the internet, and I couldn't find anything more than 1-page biography for him and nothing about the University of Science and Technology. Any more info on this guy?